An Overshadowed Original: Rossini's 'Otello' Rossini's tragic retelling of Shakespeare's classic seldom gets its due in today's theaters. Otello may have been eclipsed not just by Verdi's version of the story decades later, but also by two of Rossini's own works which premiered about the same time: The Barber of Seville and La Cenerentola. John Osborn and Olga Peretyatko sing the roles of Otello and Desdemona in Rossini's operatic version of the Shakespeare tragedy at the Lausanne Opera. It's often said that imitation is the sincerest form of flattery. But when it comes to music there are times when that flattery winds up more famous than its inspiration. For example, who comes to mind when the soul hit "Respect" is mentioned? Aretha Franklin, right? Well, fair enough. Still, the first version of the tune was actually written and released a couple of years earlier than Aretha's -- by Otis Redding. He was a legend in his own right, but Redding's original version of "Respect" is sometimes, well, disrespected. The same thing happened to a legendary opera composer when Giuseppe Verdi's Otello was premiered in 1887. That opera quickly became a landmark among musical settings of Shakespeare. But Verdi wasn't the first great composer to score a hit with an opera based on Othello -- it had already been done seven decades earlier by Gioachino Rossini. Rossini's Otello seldom gets its due in today's theaters. And it may have been overshadowed not just by Verdi's opera, but also by a couple of Rossini's own works. Its 1816 debut was sandwiched between the premieres of two immensely popular Rossini comedies: The Barber of Seville and La Cenerentola. Later on, lovers of both music and Shakespeare may have decided that Verdi's opera simply hews more closely to the original play. But, while Rossini's Otello may stray a bit from Shakespeare at the start, by the time the opera's last act begins, the composer and the bard seem joined at the hip in a hair-raising finale that rivals even Verdi's masterful tragedy. The final act of Rossini's Otello was also a significant moment both in Rossini's career and for opera as a whole. 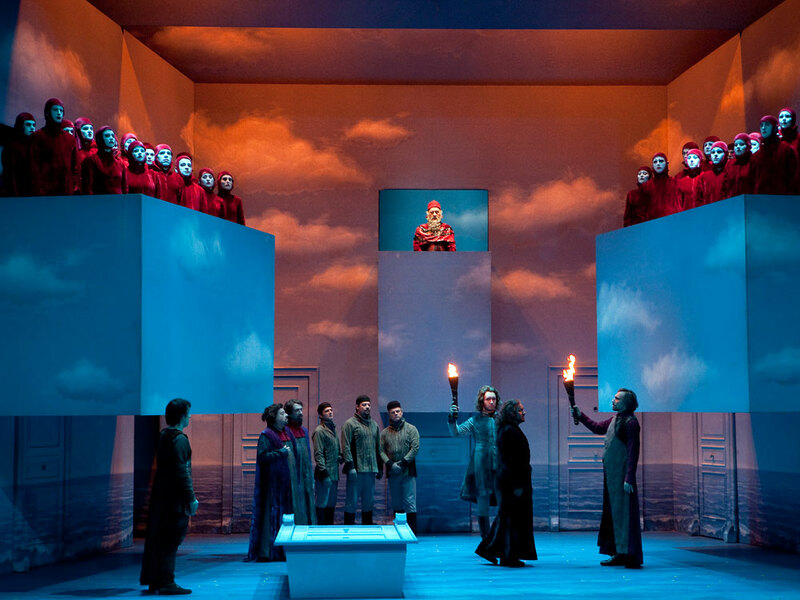 The drama's first two acts are in a fairly traditional sort of opera seria style. But with his third act, Rossini seems to enter a whole new world of freely flowing dramatic expression, carried by intensely emotional music. Even the subject matter was daring. Early 19th-century operas almost always had happy endings. But, as in Shakespeare's play, the end of Rossini's opera is both tragic and disturbing, even today. On World of Opera, host Lisa Simeone brings us a performance of Rossini's Otello from the Lausanne Opera, in Switzerland. Tenor John Osborn sings the title role, with mezzo-soprano Olga Peretyatko as Desdemona, in a production led by conductor Corrado Rovaris. See the previous edition of World of Opera or view the full archive. The last scene between Desdemona (mezzo-soprano Olga Peretyatko) and Otello (tenor John Osborn) begins conventionally enough, but in this final section of their duet the anguish builds vividly until Otello finally kills her, falsely believing that he has achieved just revenge. Like Verdi, Rossini composed a beautiful "Willow Song" for Desdemona (mezzo-soprano Olga Peretyatko) in the final act. But in Rossini's opera, the song turns into a scene all its own. Twice, Desdemona seems unable to finish and turns to her companion Emilia (mezzo-soprano Isabelle Henriquez), who finally leaves Desdemona alone as the sequence quietly ends. The Lausanne Opera production of Rossini's Otello. As ACT ONE begins, the Doge of Venice honors Otello, a Moorish general returning from victory over the Turks at Cypress. Otello accepts the accolades, but all he really wants is to be with the woman he loves, Desdemona. There are others who are standing in Otello's way. His lieutenant, Iago, and the doge's son, Roderigo, are both jealous of Otello's popularity and power -- and Roderigo is also in love with Desdemona. Even Desdemona herself is uncertain about the future. She had written a letter to Otello, pledging herself to him. But her father, Elmiro, intercepted it, and thought it was meant for Roderigo. Now, Desdemona thinks Otello may be having second thoughts -- though her lady-in-waiting, Emilia, says that if Otello truly loves her, nothing else matters. Iago has other ideas. He's in possession of Desdemona's letter to Otello, and decides he can use it to turn the two against each other. And there are more plots underway. Elmiro also has a grudge against Otello. He tells Roderigo that he's free to marry Desdemona -- and in return, asks Roderigo to tell the doge that Otello is a traitor. Elmiro then goes to Desdemona, and says he has chosen a husband for her, but won't say who it is. People gather o celebrate the betrothal. But when Desdemona discovers that she's been given to Roderigo, she resists, and Elmiro threatens to punish her if she doesn't agree to his wishes. The situation gets worse when Otello arrives, and sees Desdemona with Roderigo. He announces to everyone that he and Desdemona have already pledged their love, and Desdemona stands by him. This enrages Elmiro, and he drags Desdemona away, while Roderigo and Otello threaten each other as the act ends. In ACT TWO, Desdemona is still resisting Roderigo's love -- though she's also wondering if Otello might be having second thoughts. And Otello does have some concerns. Alone, he wonders if it was wise to risk his fame and popularity by angering Roderigo and Elmiro. Iago then joins Otello, who makes the mistake of trusting him. Iago has already hinted that Desdemona may have been unfaithful. Now, consumed with doubt, Otello wants proof. Iago says he has it, and produces Desdemona's passionate letter. Otello, not knowing it was intended for him, assumes that he's been betrayed, and vows to get even. When Roderigo appears, he and Otello argue. When Desdemona arrives, both men accuse her of infidelity, and Otello says he can prove it. Desdemona collapses in anguish as the two men go off to fight it out. Later, Desdemona is joined by some friends, who tell her that Otello has survived the duel with Roderigo. But when she's confronted by her father, he tells her she has betrayed his honor. Desdemona asks for his pity, but he denounces her instead. In ACT THREE, Desdemona is at home, in her bedroom. Otello has been banished and Emilia tries to comfort her. After hearing a gondolier sing a lonely song in the distance, Desdemona responds with a poignant ballad of her own, the beautiful "Willow Song." When Emilia leaves her alone, Desdemona prays that Otello will return to her, and then falls asleep. Otello enters through a secret door. Still convinced of her betrayal, he draws a dagger and approaches Desdemona's bed to kill her. At first, he hesitates -- struck by her beauty. But then, as she dreams about Otello, Desdemona whispers some words of passion in her sleep. Otello assumes she's dreaming of Roderigo, and he's about to stab her when she wakes up. Seeing Otello with the knife, she tells him she's innocent and still loves him. 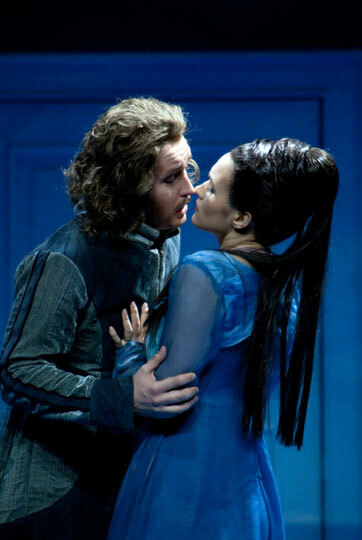 Otello refuses to believe it and mocks her, saying that Iago is about to kill her lover, Roderigo. When she hears Iago's name, Desdemona realizes that he has been the cause of all her trouble, and cries out in anguish. Otello thinks she's reacting to his news about Roderigo, and stabs Desdemona to death. Otello hears knocking at the front door and leaves the room to investigate. It's Lucio, one of his aides. Otello wants to know if Iago has succeeded in killing Roderigo. Lucio says no -- Roderigo survived. Instead, Iago was mortally wounded and confessed everything before he died, revealing Desdemona's innocence. Before Otello can react, Elmiro arrives with the Doge, who pardons Otello. Elmiro, not knowing what has just happened, grants Otello Desdemona's hand in marriage. Realizing his mistake, Otello says yes, he'll be happy to join Desdemona. Then he draws the dagger again, and kills himself as the opera ends.